Homework is no fun for anyone–including Mom and Dad. It becomes even more painful, as your child enters middle and high school grades. The probability that most parents differentiate equations every day for a living or for a hobby is pretty slim. These apps are filled with great information that can be accessed quickly and easily to make homework time move more swiftly. They are also handy tools for the times when your child has lost computer and gaming privileges. The whining stops pretty quickly, when you offer them an opportunity to study the endocrine system instead of play Halo or read Notch’s latest blog post. The Khan Academy app for iPhone, iPod Touch, and iPad is a tremendous tool for accessing informative videos for math and science. You search for courses by topics or via the search bar at the top of the catalog menu. For example, Chemistry currently has 89 videos, and you can scroll through the topics listed from basic introduction to complex. You choose your course, and then click to download the video. The information is presented logically, clearly, and completely. The depth and breadth of topics covered in the videos is impressive, and it certainly covers math and science from elementary school through intro level college coursework. The Khan Academy app for iPhone, iPod Touch, and iPad is a great resource to compliment what your child is learning in the classroom. The Human Anatomy app for iPhone, iPod Touch, and iPad is an excellent resource for your science students in middle and high school. You can choose to study or test your knowledge of the following systems: skeletal, muscular, digestive, nervous, endocrine, and reproductive. With a click, you have a view of the system with parts—just like your old Biology text book. You tap the name of the part, and a thorough definition of it and its function pops up. After you study the images and definitions, you can test what knowledge you have retained. Biology homework tends to be heavy in memorization and requires lots of repetition, so the Human Anatomy app for iPhone, iPod Touch, and iPad is a handy tool for your child to study while en route to the orthodontist. The Human Anatomy app is free, but I would certainly recommend the upgrade. The ads can cover some of the parts and definitions. For a complete periodic table and vital resource for Chemistry and Physics, iElements app for iPhone, iPod Touch, and iPad is a necessity. With one click, you have the complete periodic table in your hand or lap. You click the element, and its name and number are flashed on the screen. You click the more info button at the top of the screen, and a picture or graphic of the element and a list of its properties are available. For students who are digging more deeply into solving equations, examining reactions, and creating hypotheses, the details in the properties area will be life savers. General, physical, and atomic properties are listed for each element in incredible detail. The iElements app for iPhone, iPod Touch, and iPad makes navigating the complexly detailed and layered periodic table a breeze. The iFactor Pro app for iPhone, iPod Touch, and iPad is a useful tool for factoring and solving basic quadratic equations. Algebraic concepts are now introduced in elementary school, so the chances are very strong that your middle school student is fully immersed in pre-algebra and algebra. It would not necessarily be an app for your child, but for you to help with homework. The iFactor Pro app quickly allows you to factor and solve equations with a couple of touches on the screen. You can choose decimal mode, as well as traditional algebraic mode. The iFactor Pro app for iPhone, iPod Touch, and iPad makes Algebra homework time as fun as algebra can be. The thorough, yet simple interface of the Calcul App for iPhone, iPod Touch, and iPad does not limit this app’s ability to examine and solve complex calculus equations. One click on the help button on the home screen reveals a well organized, clearly defined list of all keyboard shortcuts needed to work through calculus homework. You’ll want to turn to this app when your child is stuck, as you can manipulate the functions to show the next step or to solve the equation. When twenty years have passed since your last calculus class, the Calcul App for iPhone, iPod Touch, and iPad is a must-have. Luckily, you no longer have to make poetry on the refrigerator, since the Verses Poetry iPhone, iPod Touch, and iPad app puts poetry at your fingertips. The Verses Poetry app for iPhone, iPod Touch, and iPad is a great help with creative writing homework as well. Writer’s block is no fun, and this app is a cool, interactive way to make that blank sheet of paper less intimidating. You move words around on the screen to craft your poetry, and you can add words from a word drawer to enhance your work. The words are randomly chosen, but you do have the opportunity to manipulate the mix in the settings menu. You can purchase additional words, if you want to craft a Sci-Fi Shakespeare masterpiece. The app incorporates sharing to Facebook, as well as an opportunity to e-mail your poem. The app is rated 12+ for language, but I did not run across anything inappropriate in the free version. The Verses Poetry iPhone, iPod touch, and iPad app makes poetry accessible for you and your family. 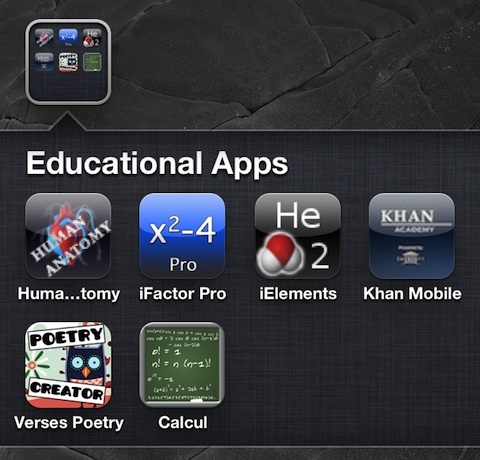 AppSafari review of Educational iPhone Apps for Middle & High School Students was written by Jenni Ward on November 1st, 2011 and categorized under App List, Education, Productivity. Page viewed 7631 times, 1 so far today. Need help on using these apps? Please read the Help Page.